This program is the first part of the Fabergé Rediscovered Lecture Series. Wilfried Zeisler explores the history of the House of Fabergé and the success of its creations among the Russian imperial clientele and later American collectors such as Marjorie Merriweather Post. He unveils new stories about masterpieces from Hillwood’s collection and other institutions. 6-6:30 p.m.: Members-only wine and cheese reception. Join today! 7:30 p.m.: Book signing. Fabergé Rediscovered is available in the museum shop. Dr. Wilfried Zeisler is Hillwood’s chief curator. He curated Fabergé Rediscovered (2018) and wrote the accompanying book on Hillwood’s Fabergé collection. Wilfried, a graduate of the Sorbonne University and the Ecole du Louvre, Paris, has written extensively on French and Russian decorative arts, including a 2010 book on ceramics and several articles. His dissertation, L’Objet d’art et de luxe français en Russie (1881-1917) [French Objets d’art and Luxury Goods in Russia (1881-1917)], was published in Paris in 2014. Between 2009 and 2011, he participated in and curated exhibitions in Paris and Monaco. At Hillwood, he curated Splendor and Surprise: Elegant Containers, Antique to Modern (2015),  Konstantin Makovsky: The Tsar's Painter (2016) and contributed to Friends and Fashion: An American Diplomat in 1820s Russia (2017) and The Artistic Table (2018). 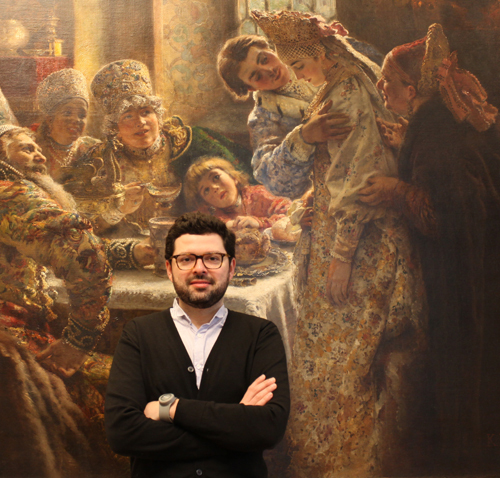 Wilfried co-authored Konstantin Makovsky: The Tsar's Painter in America and Paris (2015). Designed to delight and surprise, the treasures created by the firm of Carl Fabergé have inspired admiration and intrigue for over a century, both for their remarkable craftsmanship and the fascinating histories that surround them. Now, a special exhibition at Hillwood unveils new discoveries relating to its own collection of Fabergé imperial Easter eggs and other famed works. Whether you are a Fabergé aficionado or novice, this lecture series will offer interest and insight into the storied firm.